And you don’t even need a license to drive it. Starting at $208,000, the 562-horsepower McLaren 570S is way out of most people’s range. There is, however, an alternative, more budget friendly option that costs a mere $80 – and you don’t even need a driver’s license. Admittedly, there have been a few cutbacks. It isn’t powered by a twin-turbo V8, for a start. In fact, it doesn’t have an engine of any description. That’s because this McLaren 570S is the latest pint-sized push car developed by US toymaker Step2 for budding child car enthusiasts. You don’t get a luxurious leather-wrapped interior either, but you do get more cup holders than the real car. Designers from McLaren worked closely with Step2 to capture the essence of the real supercar for its push car counterpart. What Step2 dubs as “Whisper Wheels” give the car a quiet and smooth ride, while the race-inspired flat-based steering wheel inside the cabin offers “excellent feedback.” The driver can also get a taste of the sublime sound a McLaren makes through electronic sounds operated via the steering wheel, though we’re not sure how authentic they are. If we’re being picky, the proportions are slightly off compared to the real car, but we doubt its intended audience will mind too much, somehow. 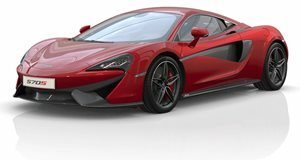 Initially, the 570S Step2 Push Sports Car, to give it its full name, will be available in Ventura Orange when it goes on sale in September exclusively through Amazon for $79.99 before rolling out into other retailers. More color choices will be available at a later date. For parents with a bigger budget, Step2 also sells an all-electric McLaren P1 ride-on for $486, complete with butterfly doors, a stereo, and a hair-raising top speed of 3 mph. The 570S is spectacular fun: the perfect blend of supercar and sports car. We joined a McLaren convoy that braved narrow English roads and bad drivers to trek to the greatest car show in the world.